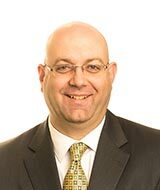 Cook Martin Poulson, P.C. can help you provide your employees a retirement plan that fits your business’ needs. Our retirement plan team consists of CPAs, and members of the ASPPA (American Society of Pension Professionals and Actuaries). We provide the expertise required to design retirement plans and implement defined contribution plans. Is your main goal to get as much into your own retirement account as you can? Do you want to minimize what you contribute to your employees’ retirement accounts? Is there a combination of numbers 1 and 2 that makes sense? The Department of Labor (DOL) and Internal Revenue Service (IRS) provide a great deal of latitude in the design of retirement plans. You need a professional retirement plan consultant who knows where the legal boundaries are. This person must also be able to advise you on which retirement plan design options will not only keep you within the boundaries set by the DOL and IRS, but will also help you achieve your own company goals in setting up and implementing a retirement plan. We work with retirement plans of all sizes, ranging from 1 participant to well over 4,000 participants. The asset size of the plans we work with encompasses a large range as well, from a few thousand dollars, to plans in excess of $20 million. 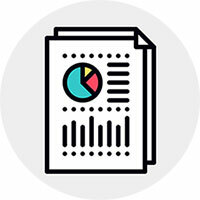 With our unique combination of Third Party Services provided by a traditional CPA firm, we are committed to providing the same outstanding service to all clients, no matter the size or scope of the engagement. We assist employers in completing the Form 5500 to satisfy ERISA employee benefit plan reporting requirements. This assistance includes preparation of current forms, as well as forms for prior years, if necessary, as required by the Department of Labor. 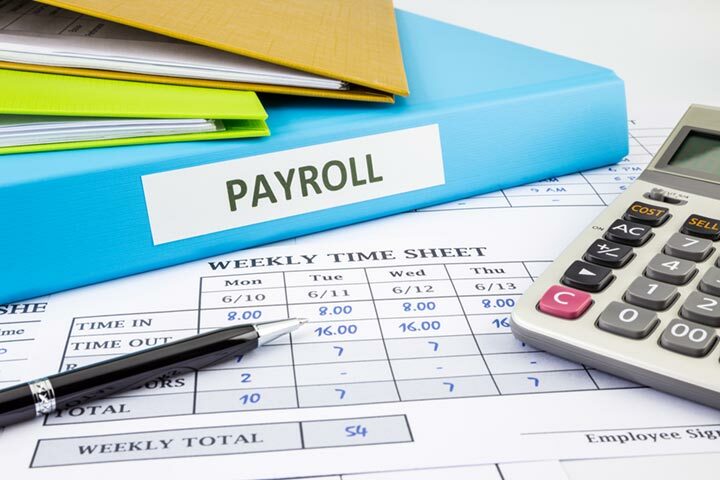 We ensure that your plan stays in compliance with the Department of Labor by preparing and filing the annual Form 5500 with the DOL, providing any testing your plan may need, and providing annual notices (Safe Harbor, Qualified Automatic Contribution Arrangement, etc.) for you to distribute to your employees. We have partnered with several large companies to ease the administrative burden of operating a retirement plan. A TPA or Third-Party Administrator is a company that assists a Plan Sponsor (employer) with plan design and regulatory compliance items. The TPA is a consultant to the retirement plan and can act as a liaison between the company sponsoring the plan and the record keeper who holds that assets of the plan. Cook Martin Poulson is a non-producing TPA, which means we work with nearly any provider, allowing a consultative approach to our retirement plan designs. What is a record keeper? A record keeper is the custodian of the assets (investments) in a 401(k) plan. They also provide financial statements to the Plan Sponsor and the Plan Participants. Do I need a TPA? Will my record keeper be responsive to questions about compliance? If I use the services of a TPA, will I get a price break from my record keeper? 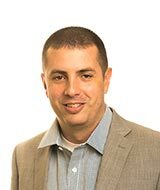 What is the knowledge-base of the person that I work with at the TPA firm compared to the knowledge-base of the person that I work with at the record keeper? How Much Does a Third Party Administrator Cost? 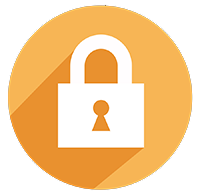 What is the difference between Safe Harbor Plans and New Comparability Plans? New Comparability Plans are plans that use an age-based disparity for discrimination testing. 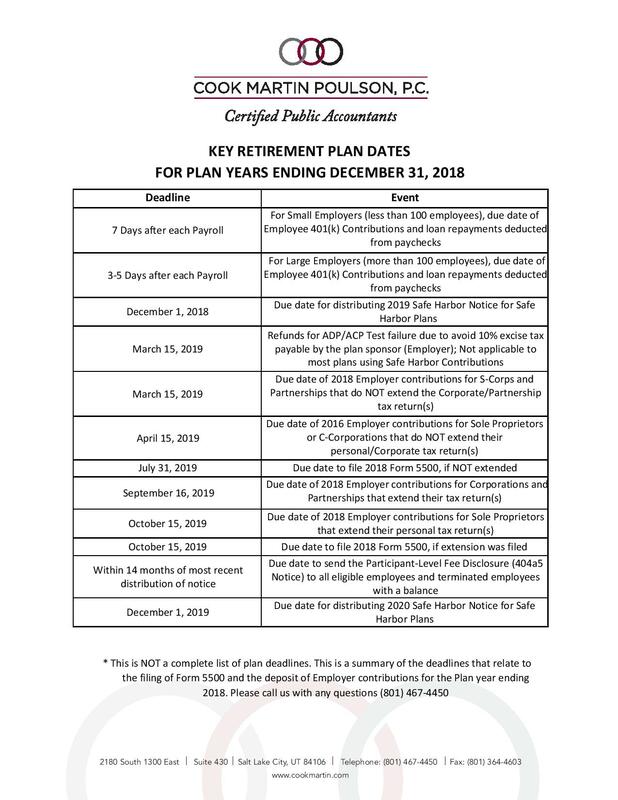 This type of plan considers the value of $1 contributed to a retirement plan today as being worth more (at retirement) to someone who has 30 years until retirement than it is worth to someone who has 10 years until retirement. It essentially allows us to create an Equivalent Benefit Ratio that lets older employees, even if they are owners of the business, receive a higher percentage of company Profit Sharing Contributions than younger employees. This type of plan design can also be structured so that each employee is in their own group. This way, Profit Sharing Contributions can be designated so that different employees can receive different benefits. Because this type of plan design requires additional consultation on the design side and expanded discrimination testing on the annual administration of the plan, the cost of the plan is higher. Traditional 401(k) and/or Profit Sharing Plans are any plans that do not require the extra design consultation and expanded discrimination testing of a New Comparability Plan. What does the Department of Labor (DOL) require? DOL compliance can be extremely complex. A 401(k) plan is generally required to file a Form 5500 or Form 5500-SF annually with the Department of Labor. The DOL is generally tasked with the responsibility of ensuring that the rank-and-file employees are provided notices and opportunities of the 401(k) plan as required by the law. The Department of Labor (DOL) requires that all retirement plans have an ERISA Section 412 bond (sometimes referred to as an ERISA Fidelity Bond) that insures the retirement plan. The recommended minimum coverage is 10% of plan assets, up to $500,000 of coverage if employer securities are not part of the investment option. Please see https://www.dol.gov/ebsa/regs/fab2008-4.html for more information. Is there other insurance that I should obtain? Fiduciary Liability Insurance for Plan Sponsors is also available. Fiduciary parties can be held responsible for not meeting their employee benefit plan management duties under ERISA. While an ERISA Fidelity bond does not protect personal assets, it should cover the assets of the plan and its beneficiaries in the case of plan mismanagement/misconduct. This type of insurance does not protect the liability of the trustees themselves. but it should protect the sponsors and fiduciaries of the plan from lawyer costs and fines in the event that they are sued for mismanaging the employee benefit plan. How can sponsoring a retirement plan help me? Retirement benefits encourage allegiance from employees. Tax credits may be available for the cost of starting a retirement plan. Tax deductions are allowed for employer contributions. Depending on plan design and demographics, it is possible for the owner of the company to realize significant Federal and State income tax savings. What is the timeframe to set up a 401(k) or Profit Sharing Plan? 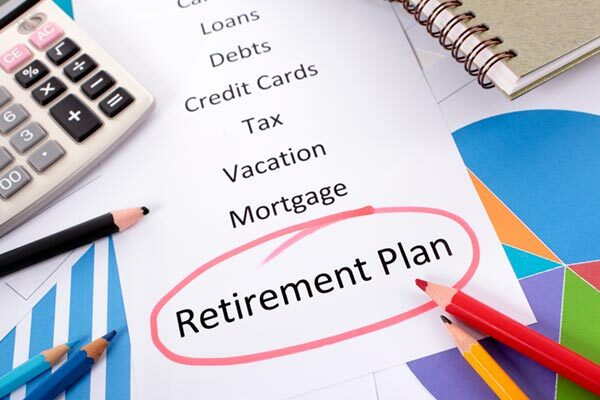 Once a decision has been made to establish a retirement plan, it usually takes 6-8 weeks to get the plan designed, communicate the plan design to the record keeper as well as contribution information, get the disclosures from the TPA and the record keeper, and conduct enrollment meetings with your employees, the financial advisor, and the record keeper and/or TPA. What is a “Safe Harbor” plan? A Safe Harbor plan is one that is deemed eligible to pass most of the discrimination tests. Generally, there are two types of safe harbor plans: a safe harbor match, where the employer only has to contribute (usually maxing out at 4% of compensation) if the employees make salary deferrals into the plan; and a safe harbor non-elective, where the employer must make a contribution (usually 3% of compensation) into each eligible participant’s account. These plans allow the owners to potentially defer from their compensation the maximum amount allowed by the IRS, without that amount being dependent on what the rank and file employees contribute. Is there a deadline to establish a Safe Harbor plan? Safe Harbor plans must have at least 3 months in a plan year. If you want your plan to operate on a calendar year, then the plan must be effective by October 1st. This means that generally, a decision to start a safe harbor retirement plan must be made around August 1st. 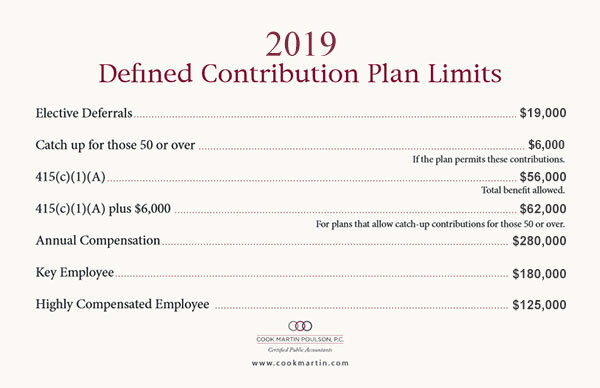 While most of the work that we do is with defined contribution plans we do coordinate with a number of companies to be able to offer the best that a defined contribution plan and a defined benefit plan can offer. Please contact us to see if one of these plans may be a good fit for your situation.